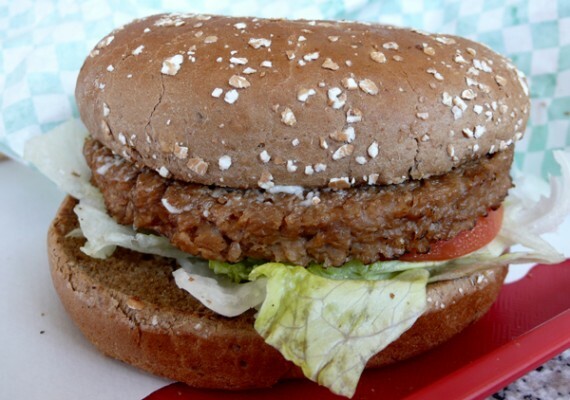 for vegans in hollywood who are looking for some quick, cheap and decent fast food…astro burger is your place. located on the corner of melrose and gower, the legendary burger joint has been around since the 70’s and has a really impressive vegetarian menu, with vegan items clearly marked. my friend ordered the chik’n grill sandwich and (being the astroburger pro that she is) got it modified with from average to delicious by adding extra toppings. she shared some with me and i was wishing i had ordered this for myself as well. 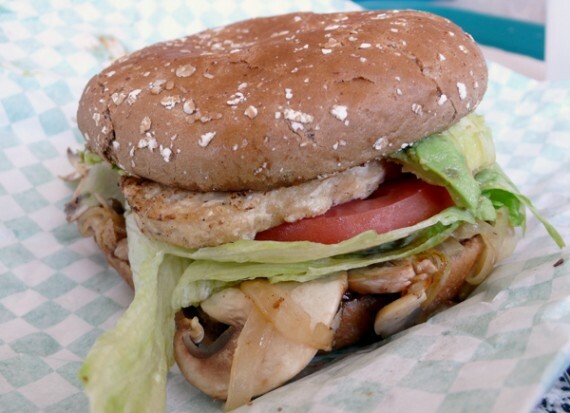 the chik’n grill normally comes with lettuce, tomato and bbq sauce…but she got it without the sauce, plus grilled onions, mushrooms and avocado. absolutely wonderful. the chik’n patty was really thick and juicy, the onions and mushrooms added tons of flavor, and the avocado provided a cool and creamy texture that complimented the cooked vegetables perfectly. it may have been falling apart, but it was one of the better vegan fast food sandwiches in los angeles, for sure. it would have been much more boring with just lettuce and tomatoes on it. i ordered the vegan flame grilled burger which came with lettuce and tomatoes, and tasted like a standard store-bought gardenburger. not much to really describe about this one, it was lightly grilled and didn’t have much flavor…next time i am totally gonna add some onions and mushrooms. 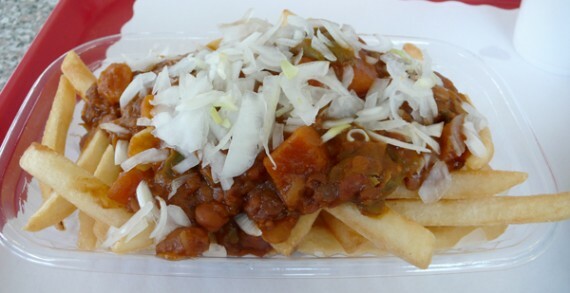 we also split an order of vegan chilli fries, which were excellent. i was expecting the chilli to contain fake meat and probably be out of a can, but instead it was just beans with a really thick sauce, sliced round carrots, and huge chunks of chillies. the crispy fries were absolutely covered with it, and it was all topped off with a load of fresh chopped onions. i really, really dug the chilli fries and would definitely order them again. between the two of us, not a single fry or bean was left behind. 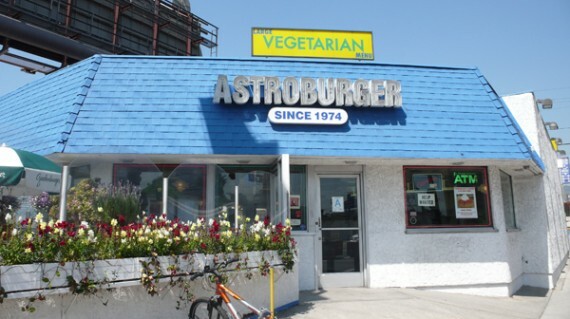 so there you have it, astro burger is definitely a place to grab some vegan fast food if you are hungry in the hollywood area. they have a parking lot and a drive thru, which is super convenient but they are cash only, which is not so convenient. they also have an atm inside the restaurant if you don’t mind paying a buck fifty surcharge in order to buy a burger. oh and don’t get this astro burger on melrose and gower confused with the one in weho on santa monica blvd. i think they are owned by the same people, but the vegan menu at the melrose/gower location is much more extensive. and yes, the vegan items are cooked on a separate grill with separate utensils, it even says so on their website. enjoy!